Dead Until Dark (Southern Vampire Mysteries, No. 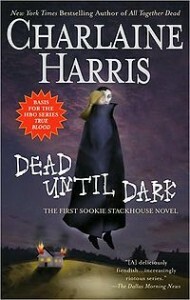 1) centers around Sookie Stackhouse. Sookie has a â€œdisabilityâ€. Her â€œdisabilityâ€ is a telepathic ability that allows her to read minds. She sees this ability as a â€œdisabilityâ€ because it gets in the way of her living a normal life. Sookie because close with Bill a vampire. Dead Until Dark takes place in a time when vampires have recently exposed their existence to the world. With the creation of synthetic blood it makes it possible for vampires to exist without preying on unwilling humans. Vampires now wish to coexist with humans. Of course, the vampires like any minority have those who hate them. I found the book to be an interesting twist on vampires. It is similar to Twilight in that is has a love story but it seems to be geared towards adults. Dead Until Dark is a fast entertaining read.